Most Texas families are familiar with Ruidoso, a picturesque mountain town just two hours’ drive from El Paso that’s cool during summer and snowy in winter. 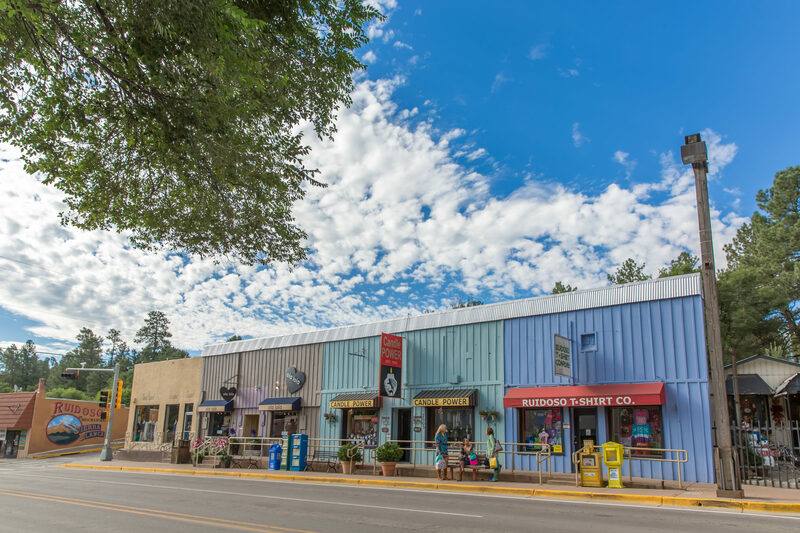 Thanks to moderate prices, a variety of recreation and dining, plus some cultural entertainment, Ruidoso’s appeal to empty nesters is spreading geographically and demographically — beyond the South and to families with children. Most fun for multigenerational groups: Ruidoso’s accommodations are individual, self-catering cabins, as you can see in our video about our home away from home, Storybook Cabins. Cabins provide room to spread out, socializing spaces, privacy and a tranquil getaway from the everyday. And that’s all you need for a successful family reunion. There’s not a lot to do in sleepy Ruidoso yet there’s plenty of recreation for fitness buffs. Check out the small meandering Rio Ruidoso. The name may mean “Noisy River” but recent drought has diminished its flow. Still, it’s a refreshing sight along Upper Canyon and the main street, Billy the Kid Trail. Small parks and playgrounds, even a dog park, are also found throughout town. All ages can come equipped or find local outfitters to go fishing, mountain biking and hiking. The Cedar Creek Trail System has several options in the easy-going 3 to 5-mile range and even in town, the paved Ruidoso River, Midtown and Links trails enable relatives in strollers or wheelchairs to get out and inhale crisp mountain air. The 1.5-mile Eagle Creek Trail, maintained by the town’s parks and recreation department, has a refreshing waterfall in summer. As you adventure outdoors, keep an eye out for deer, elk and bear who may cross your path. For the rest of us, there’s reading on your cabin porch, browsing the town’s galleries and New Agey shops, having a massage or getting the coals ready for the evening barbecue. 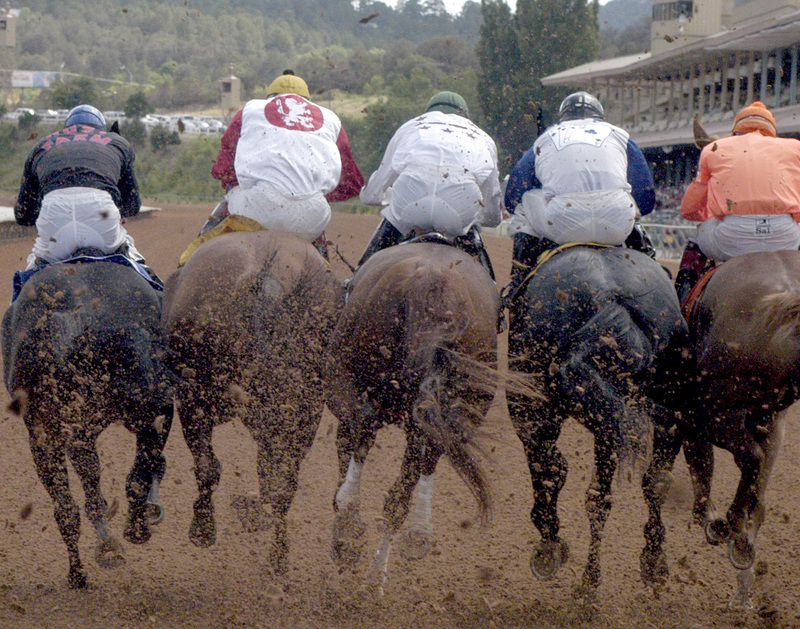 Summer entertainment by day is found at the famous Ruidoso Downs race track, notable as home to jockey Mike E. Smith, who won the 2018 Triple Crown riding Justify. Smith, already a Hall of Famer in his native New Mexico, has brought more recognition to a track that quarter horse racing fans and bettors have long known. Visitors can spend a fun, hot day in the Grandstands or opt for a shaded afternoon at the comfortable Jockey Club. You’ll sit with horse-owners in lizard cowboy boots, custom fit cowboy hats or their Sunday finery; tip sheets and betting forms provided. Day passes are $25 per adult; children age 12 and older welcome. Nestled in groves of Ponderosa Pine and Engelmann spruce, Ruidoso’s natural beauty is largely protected by the Lincoln National Forest. As you drive scenic Ski Run Road to the mountain resort of Ski Apache, owned by local Mescalero Apache tribes, look for signs of the devastation caused by a lightning strike in 2012 that eventually burned more than 40,000 acres of forest. With thousands of trees cut for firewood and thousands more left standing to propagate and refresh the soil, kids will easily understand why they see Smokey Bear “fire danger high” signs alongside many New Mexico roads. In fact, the living incarnation of Smokey Bear was actually an American black bear cub rescued here in a fire in 1950 and moved to the National Zoo. He became a national symbol of fire safety in the United States. Ski Apache, with a base at 9,600 feet and a gondola-fed peak at 11,400 feet, boasts 55 trails, mostly in the intermediate category, plus 11 lifts with few crowds. They have ski and snowboard classes for all ages that leave from the small, manageable base camp. This resort is also open for gondola-supported mountain biking in summer, and ziplining almost year-round, but it is weather dependent. 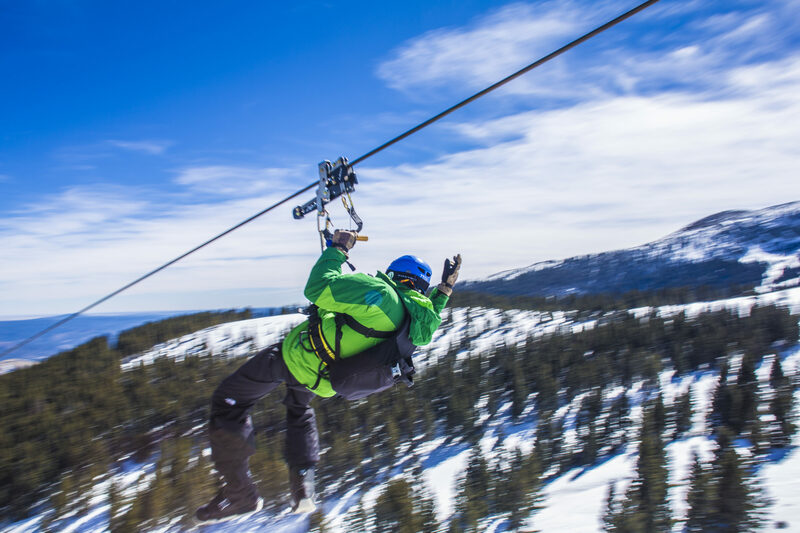 The famous Wind Rider zipline has two parallel lines that pass through three stations – over 8,900 feet — as you descend from the peak. Non-skiers of all ages can snow tube together at the Ruidoso Winter Park. In any season, be sure to look for Sierra Blanca, the 11,981-foot peak sacred to Native Americans. New Mexico’s vivid starry skies may be hard to to appreciate in town, so the Sunspot Visitor Center and Museum and observatory, about 16 miles south of Cloudcroft, is a good excursion. Evenings year-round begin with cabin barbecues or farm-to-table fare at places like Hunt and Harvest, a fun for families’ eatery inside a large market and gift shop where everyone can order to their own taste, from green chili quesadillas to tender bison burgers and grilled brussels sprouts with Sri Racha and Asiago sauce. Lots of bands pass through this resort town in summer. At our visit, the Austin, Texas based band, Asleep at the Wheel, was performing at Sacred Grounds, a riverfront café with outdoor dining, a bar serving local brews and New Mexico wines, and the busiest coffee barista in town. In nearby Carrizozo, there are free concerts each month, including by the famous Santa Fe Opera. The local Spencer Theatre for the Performing Arts in Alto is known for its concerts. Tell the teens that Inn of the Mountain Gods, a full-scale resort and casino run by the local Mescalero Apache tribe, gets big name comedians and singers and, in summer, shows outdoor movies. Families love the quiet cabin life that the town locals favor; in fact, we heard that more Texans own second homes in Ruidoso than there are full time residents. However, visitors should plan ahead for busy holiday weekends, both summer and winter. If you want to explore beyond the Billy the Kid Scenic Byway leading up to Ski Apache, the local Ruidoso Village tourist office can point you to several Native American petroglyph sites, state parks and historic places like Lincoln, birthplace of Billy the Kid, and several ghost towns. Ruidoso itself is not likely to become a ghost town any time soon.